Ardtornish Estate Self-Catering Properties are available for let all year round. When you book a property at Ardtornish you are signing a contract. Bookings are accepted subject to the following conditions. Bookings are from 16:00 on the day of arrival to 10:00 on the day of departure. Prices quoted include VAT at the prevailing rate. We do not operate a formal check in process. The key to your booked holiday property will be in the front door on the day of your arrival. A contract shall come into existence only if and when we accepted the booking by email or post. Bookings will be confirmed by us by email or post upon receipt of 50% of the accommodation rental. You will then become responsible for paying the total price of the booking. The deposit is non-refundable in any circumstance. The balance of 50% plus any additional charges are due for payment by credit card, cheque or bank transfer no less than 56 days before your booking commencement date. Any charges accrued during your stay are payable prior to departure. So long as written notice of cancellation is received not less than 8 weeks before the booking commencement date, you will not be liable to pay any outstanding balance. However, if cancellation is notified within 8 weeks of the holiday commencement date, you will be liable to pay the full balance unless we are successful in re-letting the holiday. Notification should be made in the first instance by email and confirmed by first class post to Ardtornish Estate Office, Morvern, by Oban, Argyll, Scotland, PA80 5UZ. We will confirm receipt of all cancellations by email or post. Guests paying by credit card will have a pre-authorisation processed in addition to the value of the room to cover the security deposit. The security deposit covers breakages, losses and damage to the properties contents and any cost of clean-up should the property be left in an unreasonable state. The security deposit value will be held by your credit card provider and not the Estate and will be released within two weeks of the end of the holiday. If no sale is completed it will be released as per the terms and conditions provided by your card provider. If any damage is caused directly or indirectly to the buildings, grounds or boats through your misuse or negligence we will require you to pay for all restoration and/or repairs that we consider necessary. 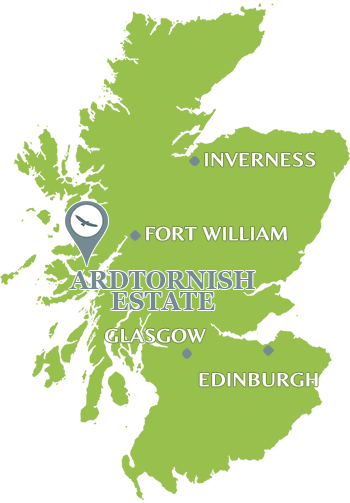 Ardtornish Estate will not be responsible for any loss or damage to any belongings, or any injuries sustained by you or any other member of your party during your stay. An inventory of the contents of each property will be taken at the beginning and end of each booking period. We reserve the right to require you to pay for any articles found to be missing or broken. If any damage is caused directly or indirectly to the buildings, fixtures, fittings, grounds or boats through your misuse or negligence we will require you to pay for all restoration and / or repairs that we consider necessary. Smoking is not permitted in any of our properties, if smoking outdoors, then please ensure that cigarettes are properly extinguished and disposed of carefully. Litter must always be placed in the refuse bins provided. For your convenience and in line with our green policies, recycling bins are provided for your use. Any items of personal effects left in the property on departure will be kept in our lost property for a period of up to three months. Items not claimed within this period will be disposed of. Dogs are permitted by prior arrangement at our discretion and at a charge of £25.00 per dog per week. Other pets are not allowed. Dogs are not allowed on the furniture. We require you to keep your dog under control at all times and to remove all faeces from the garden of the property. Dogs must be kept off of the main lawn of Ardtornish House at all times. No unauthorized shooting is permitted at any time. Fishing will be undertaken in a sportsmanlike manner and in accordance with best practice. Only individuals with a valid fishing permit will be entitled to fish on the Estate. Fishing Permits are available from the Information Centre.